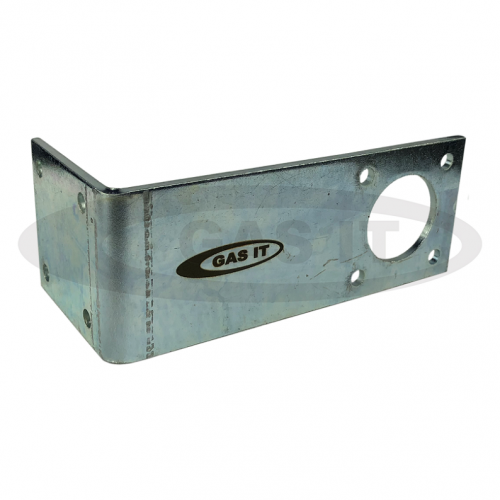 Angled fill point bracket - Long - GAS IT Leisure Gas Bottles, Gas Cylincers and Gas Tanks - Catering, Motorhome, Campervan, Caravan, Farrier and Road Repair Refillable Gas Solutions. Super heavy duty, Angled, Galvanised and Pre drilled fill bracket in 3mm steel and 180mm long. The bracket total lenght is 180mm ( 7 inch) including the bend length which is 50mm, allowing for secure fixing and mounting. This Heavy duty bracket allows you to use a fixed bayonet fill point of either GAS IT SAE Fill, GAS IT Light weigth R67 fill hose or 8mm fill pipes and fix it around the vehicle instead of drilling the body plus this bracket can be fixed to the tow bar with a simple, easy modification. We also sell a flat version of this bracket allowing full modifications and bends can be made by you.